This recipe has been dragged out because the warm weather THIS spring has cranked up our, and probably yours too – rhuproduction. It’s delicious. “And the rhubarb continues to grow. 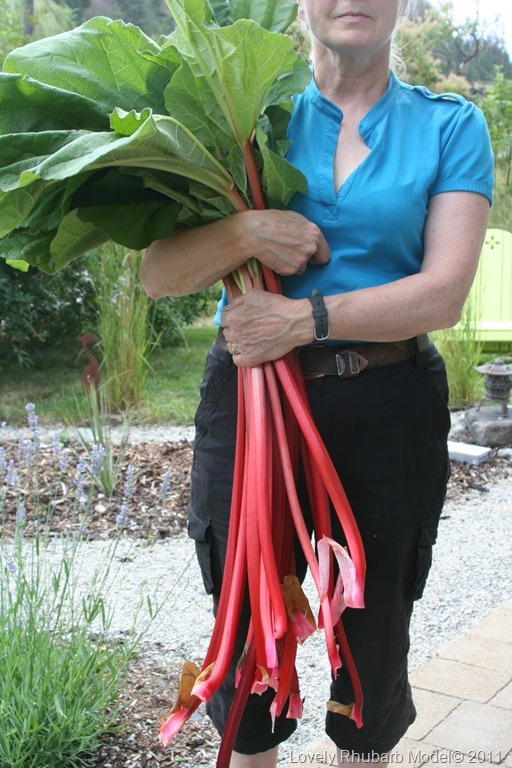 What a great summer… as long as you are a long, lanky stalk of rhubarb. Rhubarb likes this cool weather and given that we have enjoyed (?) mostly cool weather this summer, it continues growing as high as an elephant’s eye – well, not quite, but the stalks are long and beautifully red. 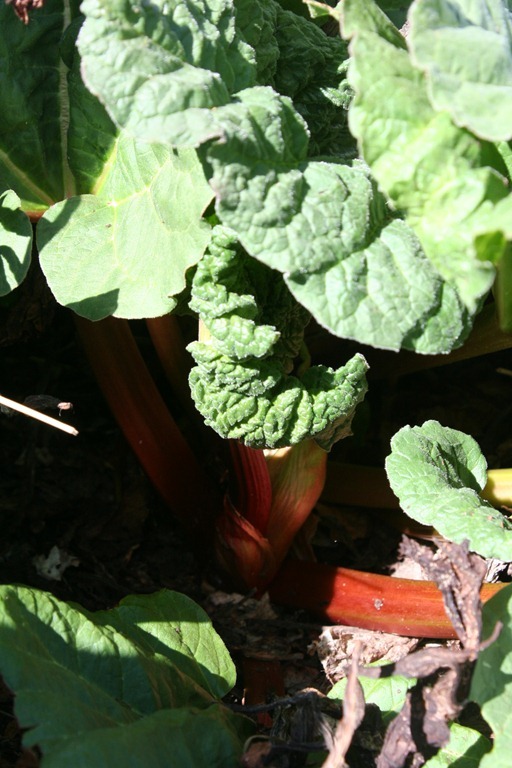 You can see how our professional rhubarb model is dwarfed by this over exuberant and over abundant pie plant. 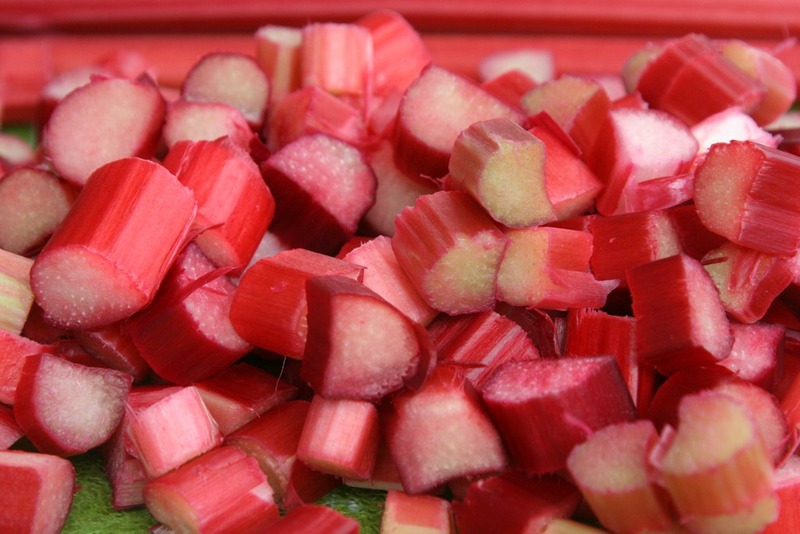 This over abundance requires some fresh ways with rhubarb. We have been eating stewed rhubarb for breakfast…daily. We have rhubarbed and rhubarbed and rhubarbed. 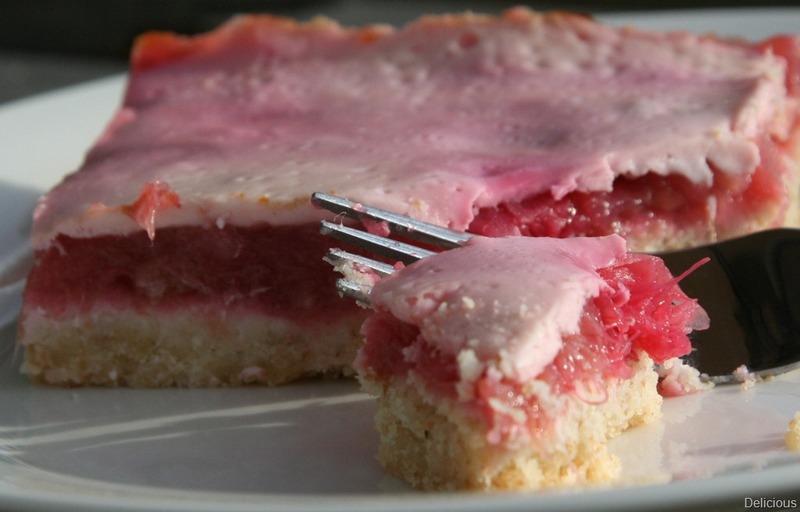 Make no mistake – I do love rhubarb even if it is a purgative. A couple of weeks ago, some twenty of our cross-country skiing pals met in Summerland for the 2nd Annual Post Olympic summer get together. There was hiking. There was mountain biking (along the newly built Trail for Humanity) and leisure biking along the bucolic, rain slicked country roads leading to some of our Summerland wineries. On Friday evening we reviewed Kathy’s slide show of our Olympic travails and on Saturday evening, a movie under the big, old night sky and, it goes without saying given that summer is AWOL, we were wrapped in blankets and jackets. Of course, a big part of any gathering is the food. “A Fish Called Wanda” was screened after wood fired pizzas and the Rhubarb Bar. Rhubarb Bar is difficult to say at the best of times. Especially after a cocktail. It was determined that simply calling the Rhubarb Bar “Rhubar” would give it a better mouth feel and it would be easier to remember. Given stewed rhubarb has been a mainstay at our breakfast table for weeks, it was not too much of a stretch to imagine stewed rhubarb as a topping for something other than yogurt. This is basically stewed rhubarb with a thickener. 1. Preheat oven 400 F (200 C) and grease baking pan. 2. 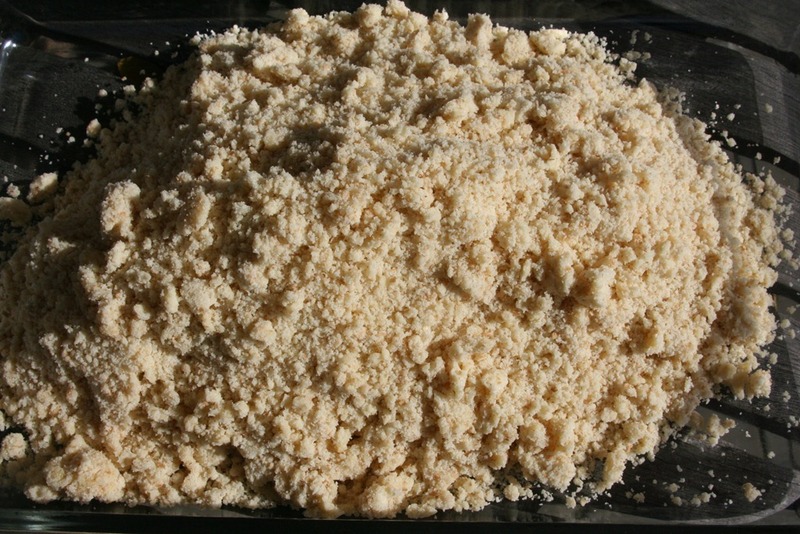 Crust: Combine flour, sugar, and salt in a large bowl. Using knives, a pastry blender or your hands (I use my hands) cut in butter until mixture looks like coarse crumbs. Add the egg. Using a fork mix lightly just to blend. Press firmly into prepared pan in an even layer. Not too firmly but then again not too loosely either. Bake on bottom rack for 10 to 15 minutes or until toasty brown. 3. 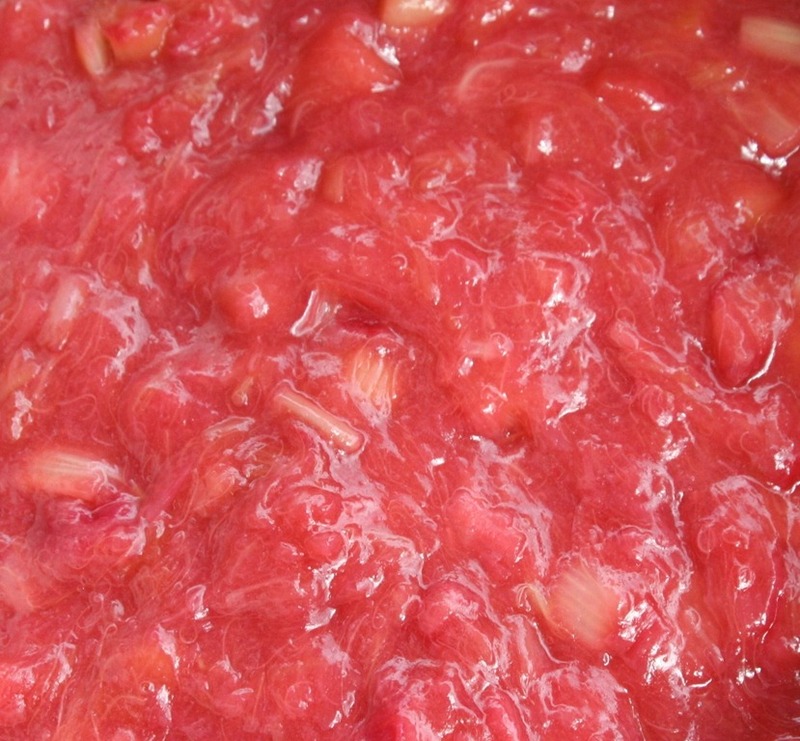 Rhubarb Topping: In a large saucepan, combine rhubarb, sugar and vinegar. Bring to a boil then reduce heat to medium and cook for about 5 minutes, stirring frequently. Dissolve cornstarch in water; add to rhubarb mixture and cook for one minute stirring constantly. Add vanilla. 4. Pour rhubarb mixture evenly on crust. Bake for 15 minutes longer. 5. While the Rhubar is baking, combine egg, sour cream and sugar in a small bowl. 6. Remove Rhubar from oven, reduce temperature to 350 F (180 C), and pour sour cream mixture over rhubarb (it doesn’t have to be perfectly drizzled) and cook for 10 minutes or until set. Serve warm or cold. Brenda, Thank you for spotting my error. That is the problem when you edit your own material. The “topping for the topping” is: 1 egg, beaten, 1 cup sour cream and 1 tablespoon granulated sugar. I have edited my blog and I thank you for following. Hi Kim! Whilst getting my ingredients together for Rhubar, I noticed that there aren’t any amounts listed for the “final sour-cream topping”. Please include as soon, as the rhubarb is bubbling away on the stove. Strawberry-rhubarb pie is one of Mr. Wiggly’s favorites so I know he will love this recipe of yours!